For serious comfort food, this Slow Cooker Chicken and Dumplings should do the trick! I bet your family would love this on a night when it’s cold outside! There’s nothing like a cloudy or stormy day to bring on the desire for serious comfort food, and in many parts of the U.S. they’ve been having a winter that won’t quit! 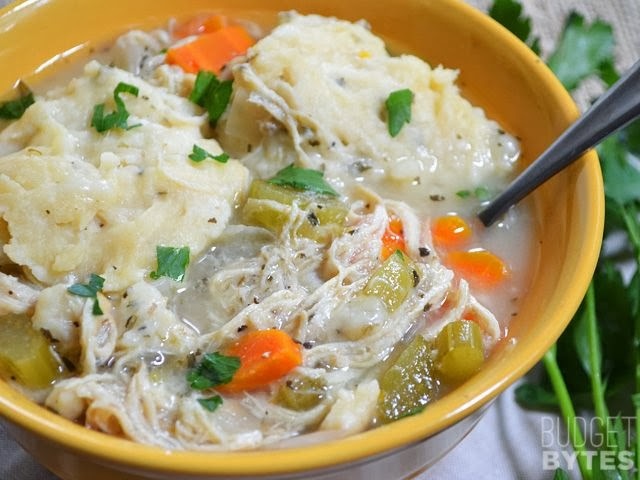 I can’t do anything about the weather, but I’m here to help in the comfort food department with this Slow Cooker Chicken and Dumplings from Budget Bytes. Beth says the dumplings in her soup are made from drop-biscuit dough; I bet this would be a hit with most families! Get the complete recipe for Slow Cooker Chicken and Dumplings from Budget Bytes.